Are you guys as obsessed with macro bowls as I am?! Truly balancing, nourishing and satisfying in every way a bowl can be. 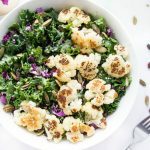 Since glow bowls are my go-to’s for quick and easy dinners, here’s a brand new recipe for my ‘Savory Kale & Quinoa Macro Glow Bowl’. 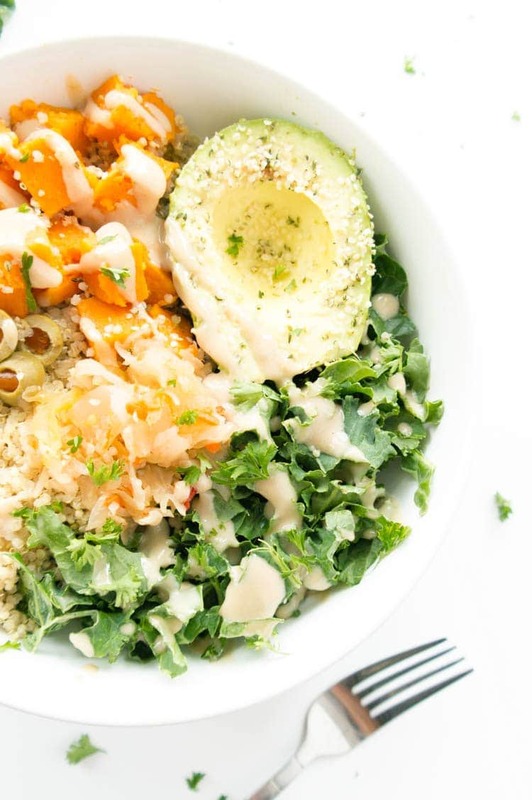 Hitting on the taste elements (like salty & sweet) and optimal for digestion, macro bowls make the most perfect food combinations. A happy belly equals a happy you. The whole philosophy is quite interesting, really. Similar to the plant based vegan lifestyle, the macrobiotic way of eating supports overall wellness by eating mindfully and naturally, but it delves deeper into what you actually put on your plate, shifting your perspective on food altogether. It supports a healthy body by decreasing imbalances in your yin and yang forces, by healing your internal cooling and your internal HOT, with food. 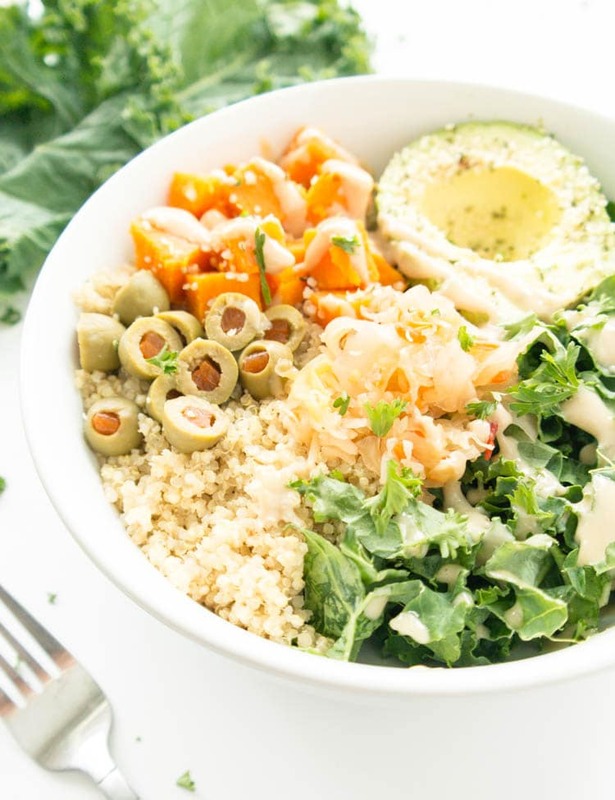 Focusing on the philosophy of how you live, your macro bowl reflects your greater purpose. Cool, right? Some true hippie stuff, but I really love it. 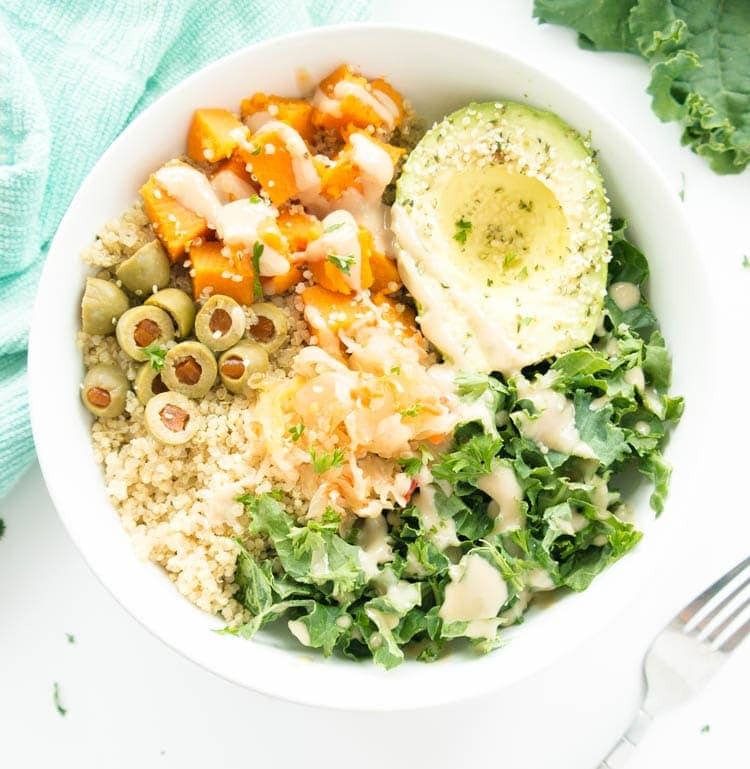 Consider this Savory Kale & Quinoa Macro Glow Bowl the winter version of my ‘Hippie Macro Glow Bowl’, which so many of you loved! 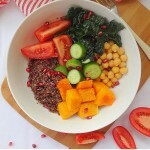 So, what’s in a typical ‘macro bowl’ anyway? 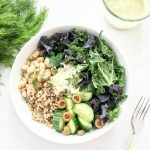 I switch up the veggies and grains often, depending on what’s in the fridge, but there’s always kale, probiotic kraut and some type of creamy tahini dressing along with a vegan protein source like beans, tempeh, legumes, etc. 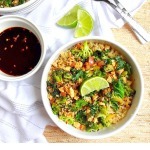 For this bowl, I added extra quinoa for my vegan protein source (plus a sprinkling of hemp seeds!) but white beans or tempeh would make the yummiest addition for protein, if you have some on hand. Roasted butternut squash adds a comforting element, with a touch of vibrant color and yumminess. Attribute the salty, savory element to green olives, while the lightly sweetened tahini sauce adds a sweetness factor to tie in the sweet & savory element. Instead of tahini sauce, you could swap in a scoop of your favorite hummus, if that’s all you have. Or, go one step further and make my creamy caesar hemp dressing. YUM! Fermented vegetables (raw sauerkraut or pickled veggies) provide healthy probiotics (living bacteria) for a happy tummy. I felt hesitant to try kraut at one point too, so if you’re weirded out, don’t be! Aside from adding depth in flavor and texture, raw kraut is just plain awesome. I pick up the Farmhouse Culture ‘smoked jalapeño’ kraut from Mariano’s or Whole Foods (here’s a store locator for you!). Keep in mind, the recipe calls for cooked quinoa and roasted butternut squash so be sure to meal prep those ahead of time. Trader Joe’s sells a small bag of pre-cut butternut squash to save you time. I like to roast a whole butternut squash to have on hand, for different meals throughout the week (like this squash soup). 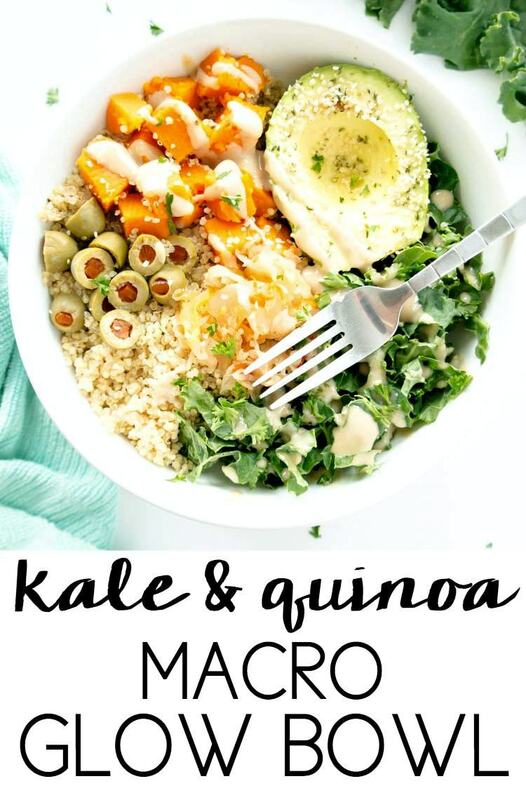 Assemble your macro bowl starting with the kale and quinoa. Add in the squash, avocado, olives and kraut, with a sprinkling of hemp seeds. 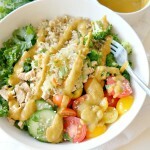 In a small bowl, whisk together all ingredients for the tahini sauce until smooth and creamy. Pour the sauce and mix it around until well combined. Prepare cooked quinoa and roasted butternut squash ahead of time. Keep extras refrigerated for more glow bowls throughout the week! 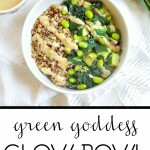 I want to see your pictures when you make this glow bowl, don’t forget to tag me on social media (@theglowingfridge)!